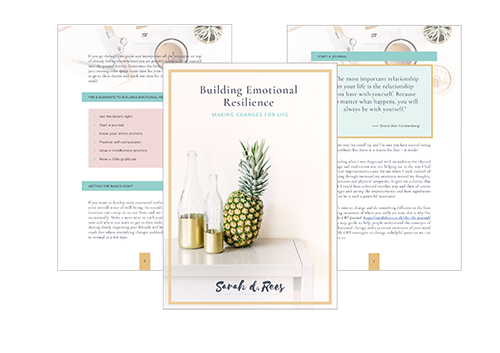 Sign up for monthly emails and your first email is the Guide To Building Emotional Resilience. Create a solid foundation of wellbeing today and a life you love. Therapy which helps you understand the unhelpful patterns you find yourself in and reverse them. Use journaling to understand the patterns of your mind and write your way to better mental health. Writing about all Modern Mental Health Matters with you in mind. General health to managing anxiety. That Sarah worked at my pace and never pushed me to do anything I couldn't do. She believed in me even when I didn't believe in myself and that gave me the motivation to carry on. I never felt judged. I can't believe how powerful the EMDR was. There has been a real shift in how I now respond to thoughts about the difficult time I experienced. It's empowering to understand how it impacted on me as I now understand how I can alter my current ways of thinking and my behaviour. If there's one word I had to choose to summarise how I feel, it would be 'empowered'. You have equipped me with knowledge and taught me how I can use that knowledge to continue my journey of improving my well-being, my relationships and therefore my quality of life. When I met you I was stuck, but you lifted me up and I now feel I can manage the rest from here! But, if I get stuck again, it's great to know I can get in touch. EMDR was completely new to me when Sarah suggested it. It was easy to put my trust in Sarah as she was so understanding and empathic. The results were astonishing and so quick! I feel like I have the old "me" back and my life back at last. I can' thank Sarah enough. I’ve never used therapy before and to be honest have always been a bit skeptical. However Sarah has completely disproved my perceptions - from my experience I can see and feel the benefits and would recommend Sarah without hesitation. Sarah was absolutely excellent - she is a fantastic listener and very empathetic. Sarah is also very knowledgeable and applied to her skills to my particular situation brilliantly. I really looked forward to my time with Sarah - she was so helpful and I came away from each session feeling I had made significant progress. Thanks for all your hard work and listening to me, supporting me to get to where I am today, without you -I'd still be in the dark. With your help and support I am a different person looking forward to a brighter positive life. Thanks again. Everything was written down so I could understand it and refer back to it and Sarah's calm manner and the way she listened and understood me, she is brilliant. I can highly recommend her.